The Hobbit is a film series consisting of three epic fantasy adventure films directed by Peter Jackson. 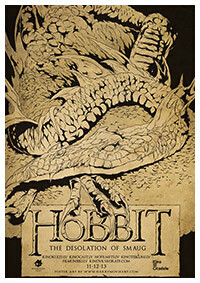 They are based on the 1937 novel The Hobbit by J. R. R. Tolkien. Portions of the trilogy are also adapted from the appendices to The Return of the King, which expand on the story told in The Hobbit. The films are subtitled An Unexpected Journey (2012), The Desolation of Smaug (2013), and The Battle of the Five Armies (2014).